Four bedroom ground floor apartment in a spectacular setting with. Master king-size bedroom suite, 2 en-suite double bedrooms and double bedroom with adjacent family bathroom. Floor cushions in Moroccan-themed third lounge provides sleeping accommodation for further 2 guests (taking maximum sleep capacity to 10). The lounge/dining room offers spectacular views of Stirling Council and the distant Trossachs mountains. There is also a snooker room and private rear garden with decking. A stone's throw from the city centre, including shopping centres, historic attractions, restaurants, bars, leisure facilities, etc. Also within a few hundred yards of Stirling Golf Club and neighbouring parkland. The historic old town, including the Castle, is readily accessibly on foot from the apartment. The apartment is fully equipped with wi-fi, TV's, dishwasher, microwave, washing machine, tumble dryer, fridge/freezer as well as all usual household items. The Kings apartment is a deluxe, spacious four-bedroom apartment which has a super king-size bedroom suite (split-level) with bath, shower and dressing area. Three further double bedrooms, two of which have en-suite bathrooms. Floor cushions (equivalent to 2 single mattresses) in the Moroccan-style lounge accommodate an additional 2 guests, taking total sleeps to 10. There is also a bathroom adjacent to the third double bedroom, which has a bath and separate shower enclosure. There are three lounges including one with dining area with spectacular views of Stirling Castle. In addition to the lounges, there is also a snooker room and the private garden with decking and garden furniture can be accessed from the kitchen. Utility room with washing machine and tumble dryer. The apartment benefits from many period features. The Victoria Apartment is a spacious ground floor one--bedroom apartment. It has one king-size bedroom with an en-suite shower room. There is also a family bathroom (bath with shower over) and a utility cupboard with washing machine and tumble dryer. The large lounge/dining room also has two futon-style sofa beds (of wooden construction) each suitable for two guests. There is another sofa bed (fold down style) in the bedroom that is suitable for 1 guest (preferably a child). Sofa beds takes total sleeps to 7. Uninterrupted views of Stirling Castle and the distant Trossachs mountains. Gas central heating - thermostat control on wall located in inner hall (opposite master bedroom - to left of display cabinet). There is a tumble dryer in the utility room. There are three fireplaces in the apartment but they are features only, non-operational. There is on-street parking immediately outside the apartment. Charged at £2.90 for 24 hours although shorter and longer periods are also available. Towels, including face cloths and tea towels, are provided. There are three lounges, one of which has a dining area overlooking the Castle. There is also a large TV lounge adjacent to the kitchen and a separate Moroccan-style lounge which has floor cushions. Built- in full size dishwasher. Built-under oven and built-under. There is also a warming drawer. Tea, coffee, sugar, dried milk. Plentiful supply of dishes, cooking utensils, cutlery and glasses. There are 4 televisions (TV lounge, snooker room and two of the bedrooms). There is a Blu-ray DVD player in the TV lounge. There is a large book collection in the apartment (mainly in the master bedroom). Snooker room with wall-mounted TV. There is a multi-room music system (master bedroom, TV lounge, snooker room, lounge/dining room & Moroccan-style lounge). The Kings apartment has a rear private garden with decking and grassed area. The decked area has a table and chairs. Local tennis courts available in neighbouring Kings Park. There are also facilities at the University of Stirling, which is around a 10 minute drive. Stirling Golf Club is approx 200 metres from the property and welcomes visitors. Nightly rates quoted are based on a minimum 7 night stay, shorter stays will be charged at a higher nightly rate. The flat was absolutely huge! Had everything we needed and a wonderful location. At the foot of Stirling Castle and across the street from a beautiful park. We walked to shopping, restaurants and pubs. Conveniently located to highways for easy travel to Glasgow and Edinburgh. Thank you for taking the time to leave a review, it is much appreciated. We are so glad you enjoyed your stay in the Kings Apartment. 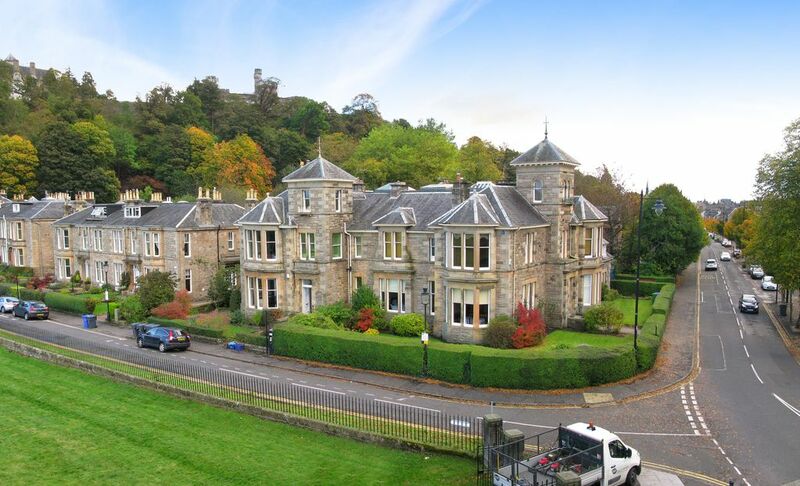 Royal Gardens Apartments are situated in an absolutely perfect position within Stirling’s historic Kings Park area. The Stirling Smith Art Gallery & Museum is immediately next door (café and gardens in addition to museum). Stirling Castle can be visited on foot only 10 minutes walk away. The former historic gardens of Stirling Castle, ‘The King’s Knot’, are situated on Royal Gardens directly opposite the property. All the facilities of the City Centre (shops, restaurants, railway station, bus station etc.) are 5 minutes walk away. Other tourist attractions which are also immediately accessible on foot include Stirling Old Town Jail. The renowned Stirling Golf Club (visitors welcome) is immediately across the street. For Golfers other more famous golf courses are within easy reach of Stirling, most notably Gleneagles (20 minutes drive); Muirfield, St Andrews, Carnoustie and Loch Lomond all approximately one hour’s drive. Stirling is the gateway to the Highlands and affords easy access to Loch Lomond and the Trossachs National Park. Stirling is within easy reach of many other must-see cities, including Edinburgh, Glasgow and Perth.